After 16 great years on this site, we have decided to move the page to a new provider.We love Tripod, and have many sites hosted here, we felt like the time has come to migrate the Fowlers Bluff page to it's new home and will no longer be updating this page. Published: Sunday, July 22, 2012 at 6:01 a.m.
A pirate’s curse is afoot, and it could be keeping some valuable booty several feet underground. Here in this swampy hamlet on the east bank of the Suwannee River, where the air thickens with mosquitoes, a legend of buried treasure is firmly entrenched in local lore. For years, through many landowners, treasure hunters have tried and failed to come up with the loot they believe was buried by 1800s French privateer Jean Lafitte — some say because such endeavors carry a curse preventing the treasure from being uncovered. 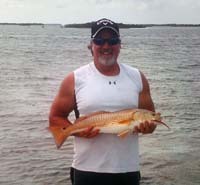 The "New Bar" Treasure Camp at the Fowlers Bluff boat ramp is getting some great reviews. My family and friends have visited the restaurant and shop there several times and the food, TV, and WiFi have been great additions to the normally off the grid community. We highly recommend using this establishment and add that it's an excellent change from the previous owner's business philosophy. Go here to read more. Here's a recent comment from one of our viewers. comment: As I enjoy 2 homes in 2 great communities, I also enjoy the quaintness of Fowlers Bluff. 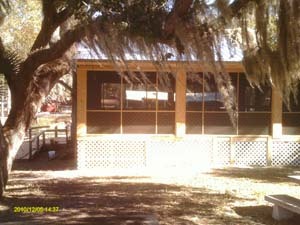 My family and on average 2 other families from Suwannee run up the river each Sunday to eat at the new 'Bar', as I hear it referred to. Yes, they do serve alchohol but also have fabulous food, great service and surprisingly a family atmosphere. We enjoy our ride up the river as 3-4 families spend time together and enjoy each others company and top if off with a great meal. My opinion is that the new restaurant adds to your value not detracts! I never liked the ugly, vacant building falling down from years of non use, how is the new restaurant not better than that? Most fisher folks have their gear, licenses and necessities before they get that far out from civilization, the restaurant owners have noticed a need and answered it. Thank goodness, we love it! Written by Gary Poyssick on 22 December 2012. Contact the writer for details on how to enter, or offer your Made in America product as a prize in the "Catch the Big Tuna" Made in America Sweepstakes here. 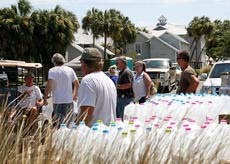 The almost 800 residents of this island town lined up Wednesday afternoon to receive a daily ration of 2 gallons per person of drinking water after the Cedar Key Water & Sewer District announced that saltwater intrusion of all three city wells had rendered tap water undrinkable. The situation — which the water board first became aware of on May 28 — was announced publicly Tuesday in an afternoon emergency water board meeting and later at a regular City Commission meeting. The investigation revealed that the pilot and two passengers were flying from Marathon and they were in route to Tallahassee. For unknown reasons the Cessna had total engine failure at an altitude of approximately 2500 feet. The pilot, Clifford Rydell, 51 made an emergency landing on CR-347 in Fowlers Bluff. Federal officials are handing over $2.8 million to a tiny, unincorporated community along the Suwannee River. 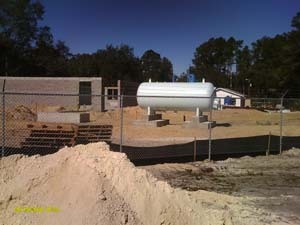 The money is for improvements and upgrades to the 42-year-old Fowler’s Bluff water system at in Levy County. The current water system was built in 1969, according to the community’s application for the federal money. Increasing river traffic and lower water levels, which concentrate boats and fish into a smaller area, compounds the problem. In almost all collisions, the victim has been knocked unconscious. In March 2007, Sharon Touchton was riding a jet ski when a sturgeon hit her. A surgeon later reattached three of her fingers severed in that collision, but she lost a fourth and a tooth, suffered skull fractures under her eyes and almost bit off her tongue. The hard-plated sturgeon can grow to seven feet in length and weigh as much as 170 pounds. They are notorious for leaping unexpectedly into the air. 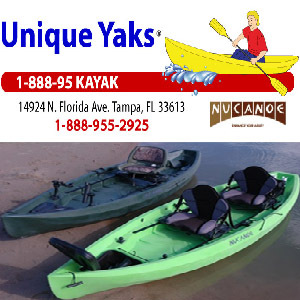 According to the Florida Fish and Wildlife Conservation Commission, this acrobatic maneuver sometimes causes them to colliding with boats and passengers. In 2007, nine people were injured in collisions with the large fish, and one man drowned when the boat he was riding in swerved to avoid a flying fish and the man fell into the water, the commission reported. 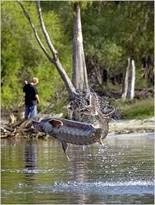 Sturgeon typically spend eight to nine months in the Suwannee spawning. This Florida river appears to support the largest viable population of these fish. Treasure hunters digging on a remote bluff overlooking Florida's Suwannee River claim they have found tantalizing evidence that pirate gold might be at the bottom of a muddy, 13-foot (4-meter) hole. To read the whole story at National Geographic, Click this link.